A number of residential building typologies have been developed on the basis of the TABULA concept. For each country a summary of the results can be found at the respective country page (click on flag below). Explanations of the items on the country pages are explained in the text below. Direct Access to the "Country Pages"
In the following the elements of the national building typologies which can be found on the country pages are explained. 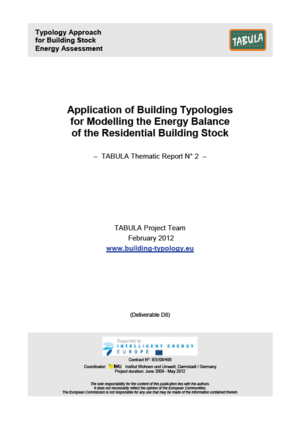 The basics of the TABULA concept for building typologies are described in the TABULA Synthesis Report SR1 . A code system is used for identification of the building types. An overview of the national building typology is given by the "Building Type Matrix". The columns of the matrix are representing different building sizes, the rows different construction periods. The cells of the grid define the "Building Types" of a country. 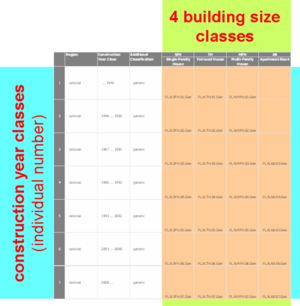 According to the TABULA concept there are 4 building size classes and a certain number of construction year classes. The start year and end year of the construction year classes are individually defined for each country. 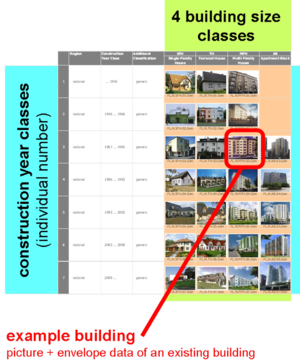 To each building type of a country (cell of the classification grid) an example building is assigned which is represented by a photo and the data of the thermal envelope. The example building is supposed to be a typical representative of the building type, meaning that it has features which can commonly be found in houses of the respective age and size class. The envelope area and the heat transfer coefficient of the example building are not necessarily representative in a statical sense. For the question of "average buildings" see below in chapter "Models of the National Building Stock". In order to enable an energy balance calculation for the example buildings the respective datasets of construction elements, envelope areas and different supply systems are collected in a common database for each country (Excel workbook "TABULA.xls", see page <Download>). In case that definitions of the national EPC procedure differs from the TABULA data structure a data transformation must be applied. which are usually only realised in very ambitious renovations or research projects. 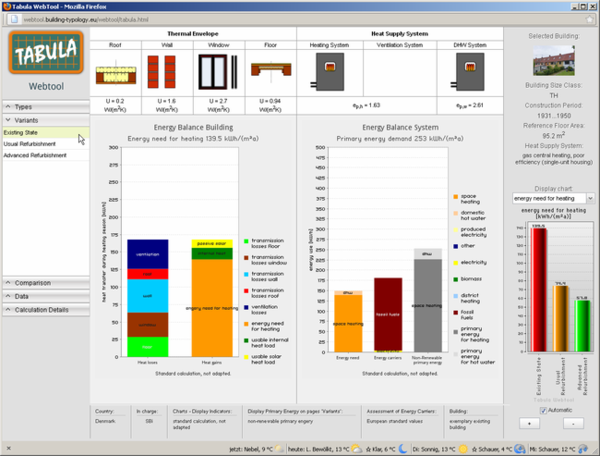 To enable a comparison of buildings and heat supply systems between countries a simple energy balance calculation based on the respective CEN standards is used. The basics of the procedure are tabled on the page <TABULA Typology Structure - Concept>. 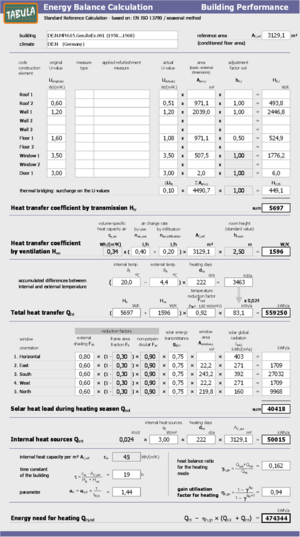 The calculation sheets are shown in the pictures below. Due to the few numbers of calculation formulas an implementation in form of a spreadsheet (1 row for each building) can easily be performed. In consequence a large number of building and system variants can be calculated in a fast and transparent way. In order to enable realistic statements as regards energy performance indicators and energy savings the ratio of typical levels of measured consumption to the standard calculation should be determined or estimated for each country. In case of estimations the calibration to the typical level of consumption is deemed preliminary - up to the time when statistical analyses of the correlation have been performed. The energy need for heating is calculated by applying standard boundary conditions and relevant national climate data. For more information consult page "Common Calculation Procedure". Each brochure is written in the language of the respective country. Example of "Building Display Sheets" from "National Typology Brochures"
The <TABULA WebTool> is designed to visualize the national building typologies. It showcases the energy consumption of typical buildings of a selected country and the effect of energy saving measures on the two levels "Standard" and "Advanced". All above mentioned elements are part of the online tool. The expert version gives access to the underlying data (see WebTool menue Calculation Details / Open Expert Version). The building and system datasets will continuously be evaluated and improved. Feedback is welcome. Access to Building Datasets by the Excel Workbook "tabula-calculator.xls"
The datasets of the example buildings and heat supply systems demonstrated by the TABULA WebTool are documented in the Excel workbook "tabula-calculator.xls" (extract from the database "TABULA.xls"). Apart from an easy data access this workbook also enables own calculations and variations on a row by row spreadsheet basis. The calcuation formulas of the webtool and the Excel workbook are identical. You can find the Excel Workbook "tabula-calculator.xls" at the page "Download". In order to assess the relevance of the building types and as a pre-requisite for the design of building stock models the available statistics are reported for each country. The basic statistics are giving account of the frequencies of building types and supply system types. Information about the energy related properties, current refurbishment grades and annual rates of refurbishment is added - as far as available. More details about the concept and the structure of the statistical tables can be found in the <TABULA Synthesis Report SR1> chapter 6. One important objective of the set-up of national building typologies is the elaboration of bottom-up models which enable a calculation of the energy consumption of the national building stock. A typical application field is the investigation of energy saving potentials for a national or regional building stock and the ex post and ex ante evaluation of instruments and political strategies. The elaborated set of example buildings, as shown above, can be used directly as a building stock balance model - as far as statistics are available for the frequencies of building types and system types and for the refurbishment state. The example buildings can be considered as a small random sample. It is also possible to merge several classes and derive a small number of “average buildings”. As a consequence the implementation of scenario analyses – which implicates the variation of a large number of parameter combinations (e.g. differetn insulation measures, supply system upgrades) – is much more easy. A further way to set-up building stock models is to elaborate "average buildings" on the basis of statistical analyses. The basis can be random samples (or a census in the best case) collected by surveys or from EPC databases. For some countries average buildings have already been derived in the framework of the TABULA project. An access to these datasets is possible by the <Expert Version> of the TABULA WebTool (identification code contains "SyAv" for "Synthetical Average" in contrast to "ReEx" for real existing building).